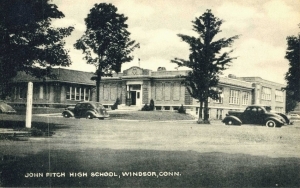 Description: Black & white photographic postcard of the John Fitch High School, Windsor, CT. Located on Bloomfield Avenue, this building served as John Fitch High School from 1922 until 1952. In the late 1990’s it became the John Fitch Apartments with housing for senior citizens.